Cocaine is a powerfully addictive drug of abuse. Once having tried cocaine, users cannot predict or control the extent to which they will continue to use the drug. Though cocaine abuse is down, it remains the second most used illicit drug in America. Cocaine is a drug created from a paste extracted from the leaves of the South American coca plant. It is a strong stimulant that affects the body's central nervous system. Cocaine can be injected, smoked, sniffed, or snorted. Cocaine can be mixed with other drugs including the anesthetic procaine and amphetamine. 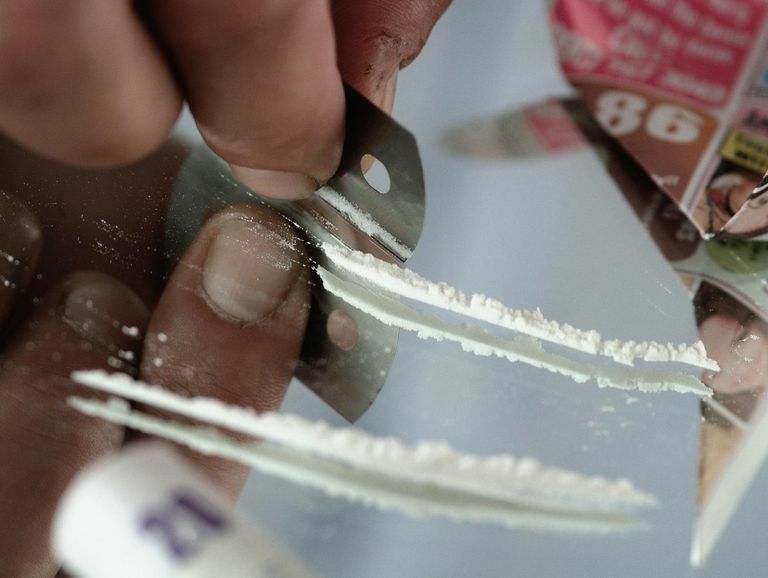 When cocaine and heroin are combined, it produces what is called a "speedball." Cocaine is a white crystalline powder. Crack cocaine looks like a small rock, chunk or chip and it is sometimes off-white or pink in color. It's common for street dealers to "cut," or dilute, cocaine with a variety of substances. This is used to make more money since it's sold by the weight. The additives can include anything that's white and powdery including cornstarch, talcum powder, flour, and baking soda. Cocaine has a wide variety of street names. Among those are Coke, Dust, Toot, Line, Nose Candy, Snow. Sneeze, Powder, Girl, White Pony, Flake, C, The Lady, Cain, Neurocain, and Rock. "Crack" cocaine is also called "freebase." Cocaine is the second most commonly used illicit drug in the U.S. Nearly 1.5 million Americans (0.6 percent of the population) reported using cocaine according to a 2014 study. The rate of use has remained relatively steady since 2009 after a sharp decline from the 1990s and early 2000s. Users can be from all economic status, all ages, and all genders. A higher rate is reported among young adults between 18 and 25 years old. The drug creates a strong sense of exhilaration. Users generally feel invincible, carefree, alert, euphoric, and have a lot of energy. This is usually followed by agitation, depression, anxiety, paranoia, and decreased appetite. The effects of cocaine generally last about two hours. Cocaine is a potent and dangerous drug. The short-term and long-term effects of cocaine are equally serious. The dangers of experiencing cardiac arrest or seizures followed by respiratory failure are equal in both short and long-term abuse. The long-term effects of using cocaine can include extreme agitation, violent mood swings, and depression. Prolonged use of snorting cocaine cause ulcerations in the mucous membrane of the nose and holes in the barrier separating the nostrils. It can also result in a loss of appetite, extreme insomnia, and sexual problems. Heart disease, heart attacks, respiratory failure, strokes, seizures, and gastrointestinal problems are not uncommon among long-term users of cocaine and crack. Crack cocaine is a highly addictive and powerful stimulant that is derived from powdered cocaine. Crack is made by dissolving powdered cocaine in a mixture of water and ammonia or sodium bicarbonate (baking soda). The mixture is boiled until a solid substance forms. It is removed from the liquid, dried, and then broken into the chunks (rocks) that are sold as crack cocaine. Crack is almost always smoked, delivering a large quantity of the drug to the lungs. This produces an immediate and intense euphoric effect. Due to its availability and intense effects, crack has grown in popularity. Health risks and problems resulting from crack use are the same as those listed for cocaine. However, because of the intensity of the drug, it is a higher risk. Cocaine is highly addictive, leaving users with an overwhelming craving for the drug. The addiction to crack develops quickly, sometimes after just a few times of smoking it. Those addicted to cocaine or crack can find help with behavioral treatments including both residential and outpatient approaches. Do you think you may need treatment for drug abuse? Take the ​drug abuse treatment screening quiz to find out. National Institute on Drug Abuse. Cocaine. 2016. Substance Abuse and Mental Health Services Administration (SAMHSA). Results from the 2015 National Survey on Drug Use and Health. 2016.